Returning to Venice for the 57th Venice Biennale, GLASSTRESS brings together 40 leading contemporary artists from Europe, the United States, the Middle East and China in an ambitious exhibition exploring the endless creative possibilities of glass. Conceived by Fondazione Berengo, the project takes place in two exceptional historic locations: Palazzo Franchetti in Venice and a converted furnace in Murano. Sarah Sze has collaborated with glass masters to create a site-specific installation composed of shards, Cotissi, informed by her experience of working in the furnace. 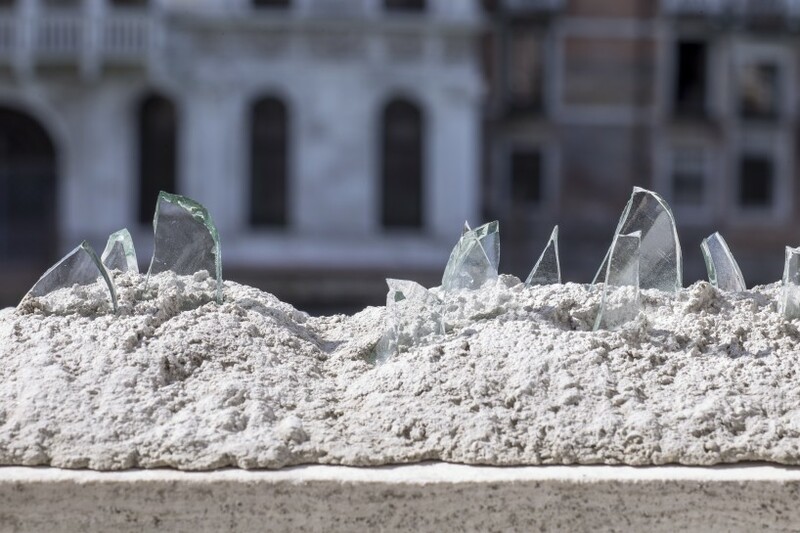 Her intervention traces the confines of the Palazzo Franchetti with a delicate, but strong line of shards of glass circling the architecture and echoing the shades of blue and green of the Laguna. Talking about the project, Sze comments: "I think what's really exciting about being in the furnace and being in the studio here in Murano is that it's about making materials live. It's the fundamental point of being a sculptor: how do you breathe new life into materials? How do you make them live in the moment?"